With the international attention that the Pan Am Games will generate, a unique window of opportunity will open to showcase the city's natural assets to an international public. 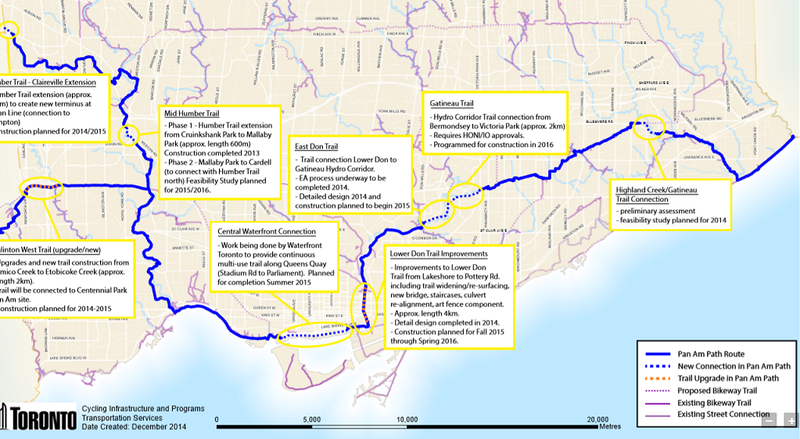 The Pan Am Path, a project initiated by an independent not-for-profit community-led organization called Friends of the Pan Am Path, aims to connect over 80km of trails across Toronto, and initiate community and arts organizations involvement in order to showcase Toronto's diverse neighbourhoods while creating a legacy for the city. The path aims to link several neighbourhoods by making use of currently underutilized ravines, parks, and urban natural corridors and making them accessible to the public. The project will enhance the transportation and recreational components of the existing network, while also creating a continuous route linking multiple Pan Am venues. Most of the project's resources are delegated to improving and creating linkages and signage, as much of the route already has existing functional paths. 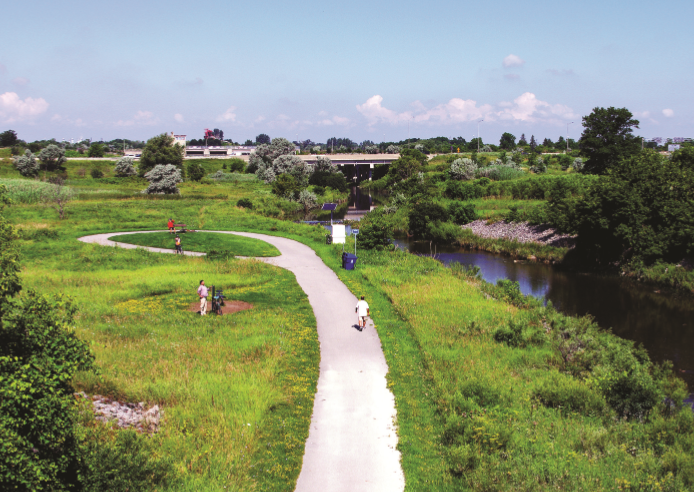 Seven out of 13 of the city's Neighbourhood Improvement Areas will be joined by the path, through the efforts of 12 community and arts organizations. The use of community and arts organizations is key in the creation of the Path, as they will facilitate and encourage involvement and actuate cultural equity. This would have the two-fold effect of creating a distinct sense of ownership over public and outdoor recreation spaces, as well as fostering inclusion and promoting community engagement and arts. 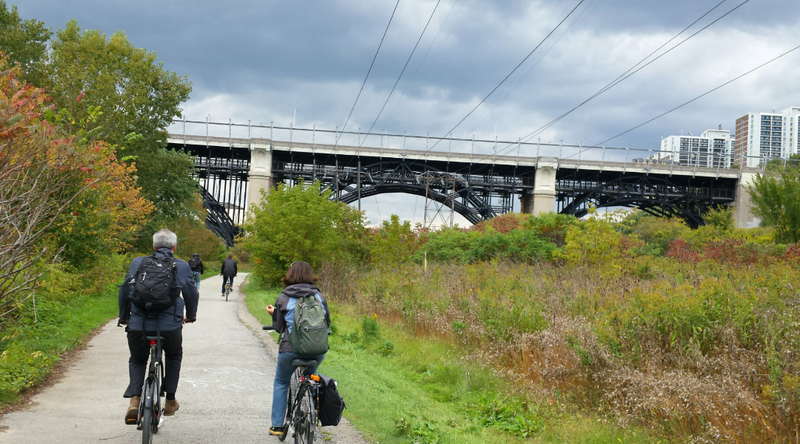 The path will allow the opportunity for more of Toronto's natural landscape to interconnect with urban areas, creating greater accessibility for cyclists and nature lovers, and garnering the city much more appeal as a cycling destination. This could also create new opportunities for tourism, as well as creating new transport routes for cyclists, and greater accessibility for recreational hiking. The Pan Am Path is a unique opportunity to create equity and promote healthy living and environmental sustainability. 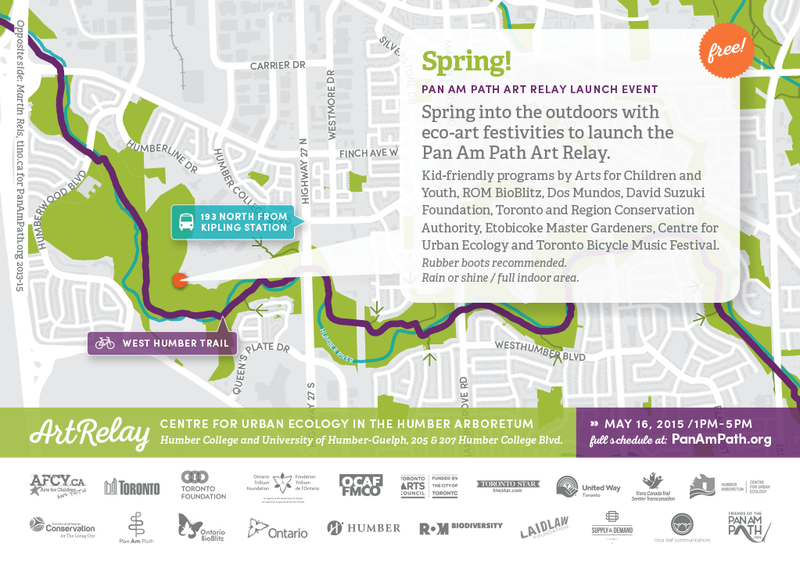 An exciting new event taking place this coming May is the Pan Am Path Art Relay Launch Event. The event will include many indoor and outdoor activities (rubber boots are recommended!) including programs for children. This event is FREE and will take place at the Centre for Urban Ecology at the Humber Arboretum at Humber College and University of Humber-Guelph, 205 & 207 Humber College Boulevard on May 16, 1 p.m. To 5 p.m.